Grateful for my friends and my family. Happy to have had relatively good health for myself and most of those I love. Blessed to have a roof over my head, food to eat, and a few little nice surprises or splurges here and there. Fortunate to be working in a creative industry I love. Fulfilled to be publishing books that I, myself, enjoy. And working with so many talented people. Thrilled to see so many beautiful pieces of art come to life, and add to the archives of our human existence. Anticipating new projects in both publishing and film that I can't wait to get started on! I remember the quiet moments, the times in nature, the hours writing, the spontaneous laughter, the songs I've danced to, more vividly than the pin pricks or outright slugs. 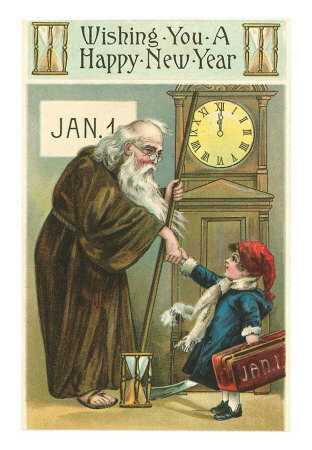 So, for all of us this coming year, I wish us an abundance of the good, and the joy, and the feeling of peace that is often indefinable... and of course...a Happy New Year! Honeysuckles makes me remember playing with a gaggle of puppies in my backyard when I was 5, Patchouli reminds me of the fragrance that my friend puts in his clothes drawer permeating everything he wears, Roses make me remember a certain perfume I use to buy my Mom, baking bread reminds me of snowy days in Connecticut. The smell of hot chocolate reminds me of my Grandmother. In the midst of spending and wrapping and unwrapping and eating, it's the little things I think about most during the holidays… putting together a gingerbread house (it's never perfect), making cut out cookies with my nephew and niece's kids (assuming I can keep them from eating all the dough), drinking hot chocolate. That last one, of course, doesn't have to be relegated just to the holidays. But it was something that WAS relegated to "treat" status in my youth. Something to have when we were sick. Or something to have when we were spending the night with Maw Maw. Spending the night with Maw Maw, usually with my cousin Lisa, or our cousin Kevin if he was in town, was always an adventure-- packing a bag with pajamas and toothbrush and setting out to someplace other than our own house for the WHOLE night! A place with handmade quilts and pillows filled with feathers. And of course, after that came breakfast! 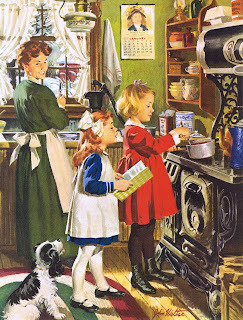 One of the things we always looked forward to was breakfast in what seemed like then… and probably was… a large, and disorganized, country kitchen. In my mind, the layout is very vivid, and despite the fact that the house was later sold, and Maw Maw is now many years gone, this version of a perhaps glamorized room still lives on in my mind: On the left, there was a pantry that led into the backyard. A little bit of a scary room with cabinets sporting metal handles, dusty jars labeled with peeling tags and an actual breadbox--the contents of which I never explored. It was the room that company usually didn't see, ya know, thus the lack of decor. I was told that Maw Maw would ring the necks of her own chickens in the backyard... (or did she use a hatchet ? ), and pluck the feathers in the pantry, but I never saw this event. The backyard--someplace we oddly never ventured--was pretty sparse, which is hard to imagine, since later on in her life, Maw Maw was an avid gardener, and her future yards were never complete without a literal field of tulips. I guess she was too busy running her cleaning business back then--Maw Maw was quiet the entrepreneur,and a good businesswoman. But still, she was not too busy to still make her own lye soap (I remember that smell too). And not too busy to have her granddaughters over to spend the night. The center room of the kitchen boasted the sink, sometimes full of soaking cucumbers on their way to becoming pickles, or something on it's way to being canned. It was serviced by well water-- and always tasted so strange to me! And even now, if I have well water it takes me back to that moment in time. 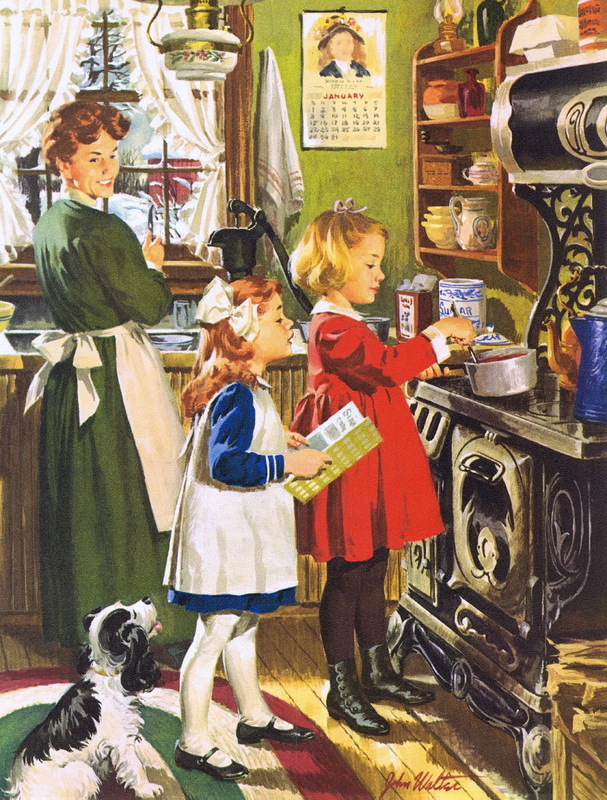 The old stove was opposite the sink, and in-between was the door on the right that led into the family dinning room. My favorite part of the kitchen, accented in white and red, was by far the breakfast nook. It was a cozy little area off to the left of the kitchen door, walled in on three sides, and decorated with plates of various sizes and patterns, consisting of a table and the three-sided square of benches taking up the whole nook. Such a safe little place for a child, in an otherwise big house. That's where Lisa and I would have breakfast, waking to the smell of frying eggs, thick cut bacon (the only kind Maw Maw liked), toast… and our favorite: Hot Chocolate. 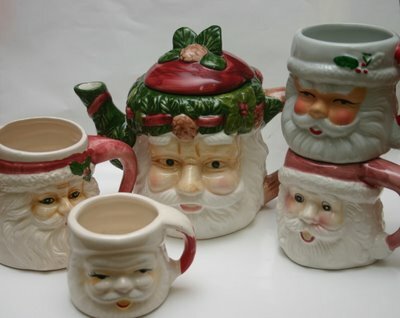 Maw Maw was a coffee drinker (I wasn't yet of course), and I vividly recall the way she drank it… pouring it into a saucer to cool it down, and drinking directly from that saucer. I don't think I've ever seen anyone else do it that way… but I'm sure it is probably something she saw her parents do. Just like eating cornbread in buttermilk. As for us, we certainly didn't feel deprived. Maw Maw made the best Hot Chocolate and Cocoa. And I'm not talking about the instant ,pre-packaged stuff. Maw Maw made it from scratch. And there is nothing that tastes better than that when it is made with real milk. Funny something so small sticks in your mind. But I'm convinced, it's not only the list of ingredients in a mug, that makes such moments so memorable. It's the process, the slowing down… the ritual of such things. I can't imagine how different those mornings would be in my mind if, for example, Maw Maw had quickly made instant cocoa, and then piled us into the car to go to McDonald's for breakfast instead. I don't remember even having a McDonald's then… thank goodness… so, we sat in the breakfast nook instead. She cooked the eggs and bacon and sawmill gravy from scratch, she slowly stirred the milk for the chocolate so it wouldn't burn, Lisa and I sat in our nook, while Maw Maw asked us about our lives, told us stories about when she was a kid, and, honestly, probably nosed around a little bit to see what we knew that she might not about other goings on in the family. But she sat with us for that leisurely time, didn't she, despite that she had a business to run, in that little breakfast nook surrounded by decorative plates and her salt and pepper collection, and she sipped her coffee out of a burgundy rimmed, porcelain, flowered saucer with a little chip somewhere on the side from years of use… and we drank our chocolate, sometimes out of hand painted Santa Claus cups, depending on the time of year. Every once in a while she'd laugh and say "Well, Renee!" or "Well, Lisa!" feigning surprise over something we'd said, drawing out the vowels of our names, just a little for affect. Finding time to TAKE the time. I'm not sure when the "FAST became better trend" started. Maybe it's when the economy , at first slowly, started to require families in America to work one, two, three jobs, when we were encouraged to go into debt to "have," when "fast" somehow became perceived as "better." I don't know, but the "fast" has overtaken us stealthily over the last forty years. My Mom has a collection of cookbooks from the 70's for example with titles like: "Microwave Cooking," "Meals in Minutes," "Microwave Miracles: The Short Order," not that she ever uses these-- they were required gifts in that era as surely as bell-bottoms and fondue pots--but they are also part of a time-capsule, a sign of the times when this prepackaged need for "quick" was gathering steam, I think. It is a paradox in the extreme that the very inventions that purport to save us time, really cost us time instead. It's not hard to halt the wheel. Just start by thinking of one thing we've gotten into the habit of doing the fast way, and do it the slow way one time instead. Bake cookies from scratch; Put together your own peanut butter and jelly sandwich (it's surprisingly easy); Slice the cheese yourself and open a pack of Saltines instead of getting pre-cut, prepackaged, highly expensive snack packs; Read a book instead of waiting for the movie; Cook something in the oven instead of the microwave… and yes, make the hot chocolate the old fashioned way, stirring it slowly on the stove while you talk to…someone. Now, don't get me wrong! I'm not saying I always practice what I preach. But I can guarantee you that the times that I have, are much more memorable than the times I haven't. The Beef Stroganoff I've made from scratch for my friend, sticks in his mind much more than the other times I was rushed and made Hamburger Helper. My walks across New York, more memorable than taking the subway. And I've never remembered one single thing I've made in the microwave (except those eggs that exploded that time). That nothing is rushed… that one moment isn't quickly tossed aside in anticipation of the next. In short, I wish you all, a cup of nice sllooowww....Hot Chocolate. Put all ingredients in a heavy-bottomed saucepan. Place pan over a medium flame; bring milk to a simmer, stirring constantly. Do not let the mixture boil. Remove from heat when the chocolate melts. 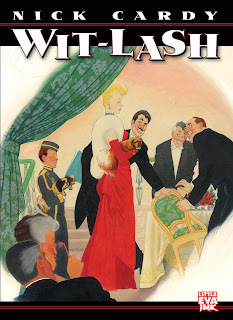 Artist Michael Golden is known as one of the best storytellers in the Comic Book industry, with his cover work and interiors in high demand. 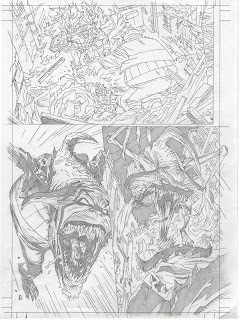 As such, Michael Golden was tapped by Todd McFarlane to pencil and breakdown the interiors of the top selling "Spawn #200," featuring some of Golden's first interior storytelling in many years. Because Michael did not ink the interiors, this collection of original art serves as the only record of Michael's interior pencils and storytelling for the Issue of "Spawn #200," which also marked a spike in the series sells by 278 percent. 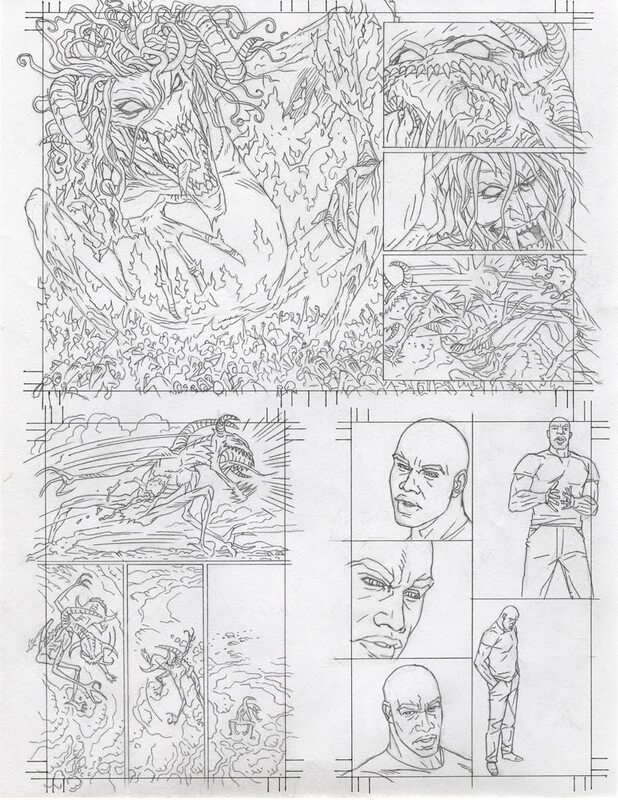 Michael's interiors for this issue will be sold as a set, and because of the rarity of these pages, we will not be able to send out jpegs of the complete issue because of the collectibility of this work. A few sample pages are above. 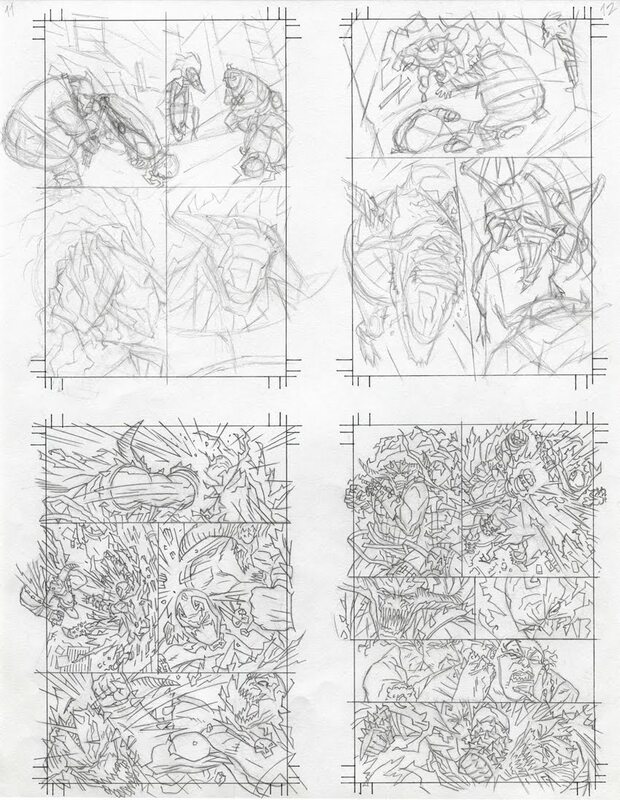 As far as the Issue 200 Breakdowns are concerned, there are a total of seventeen (17), 8.5 X 11 pages. Ten (10) are four story pages per sheet of paper; most are complete/tight breakdowns, some are roughs or double-page spreads. 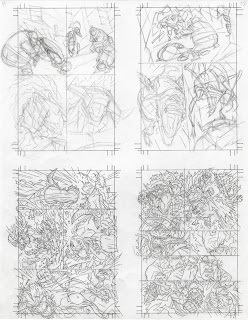 The other seven (7) are a single story page per sheet of paper, with some of the panels being full pencil renderings. 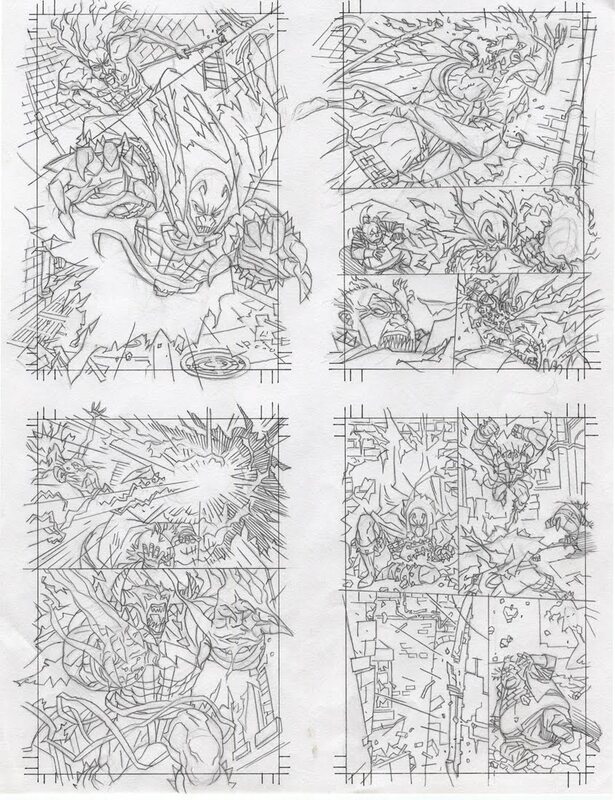 Today, they comprise all of Michael's work on Issue #200 of Spawn. 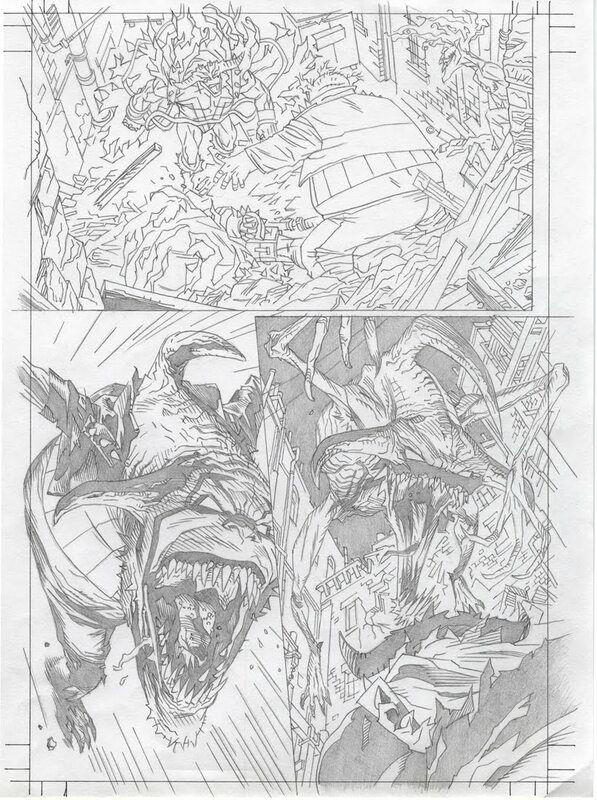 Again, these breakdowns are extremely rare, since of course this is the only original art that exists for this milestone issue. This is only a small portion of the Golden originals we have for sale. "Joe Jusko: Maelstrom" Available for Ordering-- New Sketchbook in a series from Eva Ink Publising! 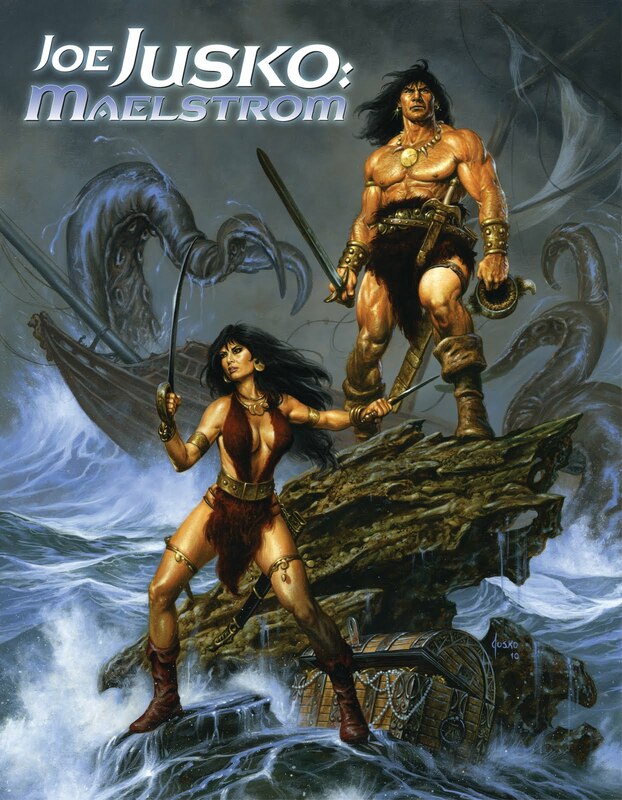 "Joe Jusko: Maelstrom" is a lush 48 page, full color book, and showcases works by Jusko not featured in any other sketchbook or artbook! A great follow up to last year's book "Joe Jusko: Savage Beauty." Jusko is undoubtedly one of the best known Fantasy, Pin-Up and Comic Artists in the world today. His career has spanned over 30 years, starting with the sale of his very first cover for Heavy Metal Magazine in 1977 at the age of 17. Since graduating that year from NYC's High School of Art & Design, Joe has worked for almost every major comic book publisher, producing hundreds of images for both covers and interiors. His work has appeared on paperback book covers, calendars, posters, t-shirts, toy packaging and innumerable trading cards, most memorably the multi award winning 1992 Marvel Masterpieces Trading Cards. The popularity of that set has been credited with initiating the painted trading card boom of the 1990's, and led to his groundbreaking 1995 Art of Edgar Rice Burroughs trading cards. Those 125 paintings have made him the most prolific Burroughs artist ever, producing art based on almost every major book by the famed author. He is currently the cover artist for the "John Carter of Mars" series. 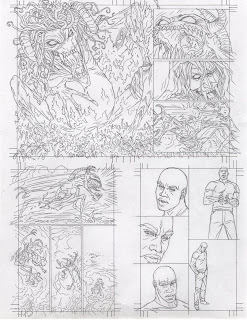 His recent work includes monthly painted covers for Dynamite Comics' adaptation of Edgar Rice Burroughs' WARLORD OF MARS, covers for VAMPIRELLA and a 4 issue WOLVERINE/HERCULES minis series as well as numerous independent publishers. His 2005 fully painted graphic novel based on Lara Croft, the heroine from the Tomb Raider video game series, won a Certificate of Merit from the prestigious Society of Illustrators, into which he was inducted in 2007. His hardcover "Art of Joe Jusko" book was released by Desperado Publishing in May, 2009 to rave reviews, and "Savage Beauty" his first in a series of hardcover sketchbooks from EvaInk Productions was released as of November 2010. He's currently developing a graphic storytelling property with Steve Niles' (author of "30 Days of Night"). The print run is limited to 1,000 copies. Contact us at: evaink@aol.com for more details. Payments are accepted via paypal or via credit card when ordering directly from Eva Ink. For more information, feel free to drop us a line. And if you don't own "Joe Jusko: Savage Beauty" yet, ask about acquiring both books, and receive a 10% discount via the Eva Ink store. Hey Everyone! 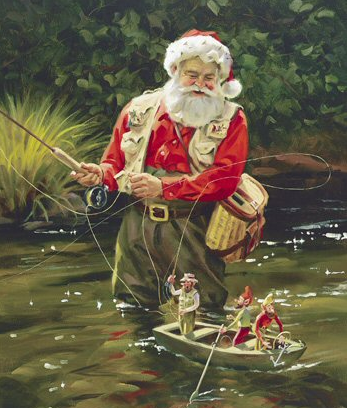 I know a book may be a bit big to put in a stocking, but that special comic lover or art aficionado on your Christmas or Chanukah list will love one of our art books from Eva Ink Publishing anyway! Now, while supplies last throughout 2012, Eva Ink Publishing will be offering all of our retrospectives and sketchbooks on ebay at a special prices. "Michael Golden: MORE Heroes and Villains"
"Mark Texeira: Nightmares and Daydreams,"
"The Naked Fat Rave Portfolio"
All of the books will be offered continuously until they sell out like the first Michael Golden sketchbook did this last year, then I'll relist the ones that are still in stock, so be sure to add me to your favorites list. So, snag one now--for someone you love...including yourself! !